Miłosz Orzeł | .net, js, html, arduino, java... no rants or clickbaits. 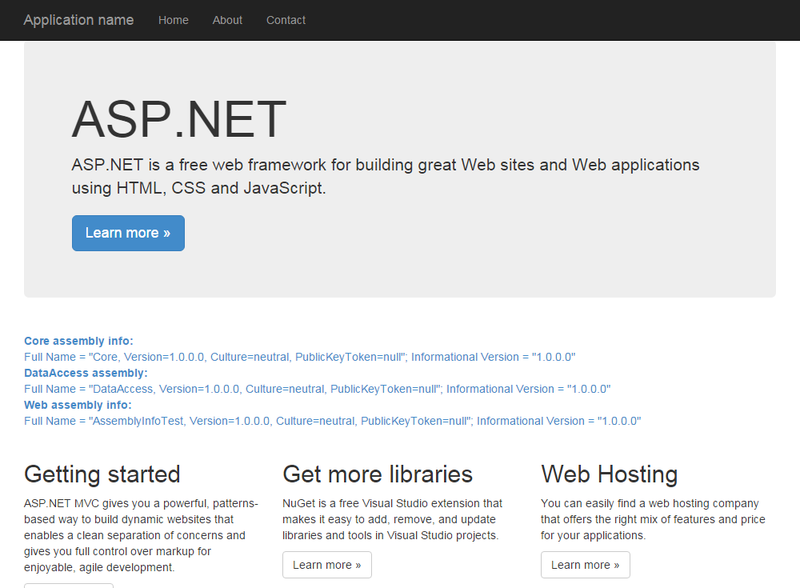 .net, js, html, arduino, java... no rants or clickbaits. everything was working fine! Fortunately fixing it didn’t require any BlogEngine code changes – all thanks to URL Rewrite Module 2.0 (available since IIS 7) and system system.webServer/rewrite Web.config section. It has a single rule that matches all addresses that contain post/ and end with .aspx and triggers redirect action to the same address but with .aspx part dropped. Rule has a name (something describing the purpose of the rule is welcome) and stopProcessing=”true” setting which instructs IIS to skip any further rules for matched URL (yes, there's only one rule but having stopProcessing=”true” makes our intention clear). We want the browser to look for a new address hence type="Redirect" is set. Ok, so the above rewrite should be all that’s needed to make .apsx problem disappear! Doesn’t work on your machine? Read on! Java and C# are very similar languages so if you have to switch between the two it’s easy to overlook subtle differences. One of the tricky bits is the meaning of protected access modifier. // DIFFERENT BEHAVIOR IN JAVA AND C#! Unfortunately I don’t have time to write the post mentioned above but the good news is that you definitely can use SparkFun USB Host Shield with USB Host Shield 2.0 library to steer servos with PS3 controller :) Here’s a short video of how it worked on my paintball turret. And here’s a clip of test circuit (hardware diagram). 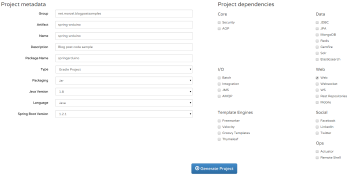 Complete code of sample application is available in this GitHub repository. It contains two attributes: AssemblyVersion and AssemblyFileVersion along with a comment that describes numbering pattern recommended by Microsoft. We will also use another attribute: AssemblyInformationalVersion which is not added by default. 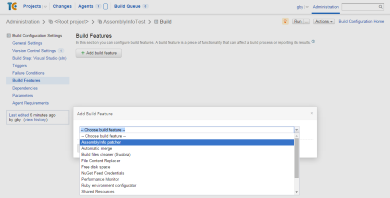 AssemblyVersion sets version number that is recognized by .NET for dependency resolution. AssemblyFileVersion is used for file version as seen by Windows and AssemblyInformationalVersion is meant more for human consumption as it can contain strings (we will make use of it for holding Git commit hash)... Detailed description of the meaning of these attributes is outside scope of this post but check this great SO answer if you want to know more. 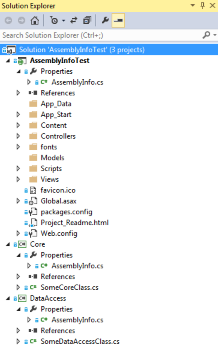 You can see how the most important assembly version number (the one used by .NET and designated by AssemblyVersion attribute) is a part of assembly's FullName. Informational version (the one that can have strings) is taken with the help of FileVersionInfo class. You can get the number form AssemblyFileVersion attribute too - just check all the interesting stuff that GetVersionInfo method returns... The same kind of code is used in GetAssemblyInfo methods in SomeCoreClass and SomeDataAccessClass. To solve it you would have to restore Nuget packages during build (here’s some info on how to do it). Before setting up AssemblyInfo patcher, add two new build parameters: Minor and Major. These are meant to represent two initial segments of version number and should be set manually - it's your (technical/marketing?) decision whether to name your next version 1.9 or 2.0, right? 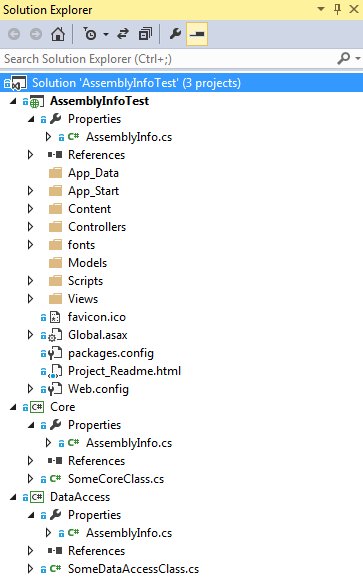 Properties window shows version set by AssemblyFileVersion and AssemblyInformationalVersion. I have Polish Windows so the properties are labeled Wersja pliku (it means File version) and Wersja produktu (it means Product version). Keep in mind that AssemblyInfo patcher will not work if version attribute has non-standard format (or AssemblyInfo files are in unusual locations). 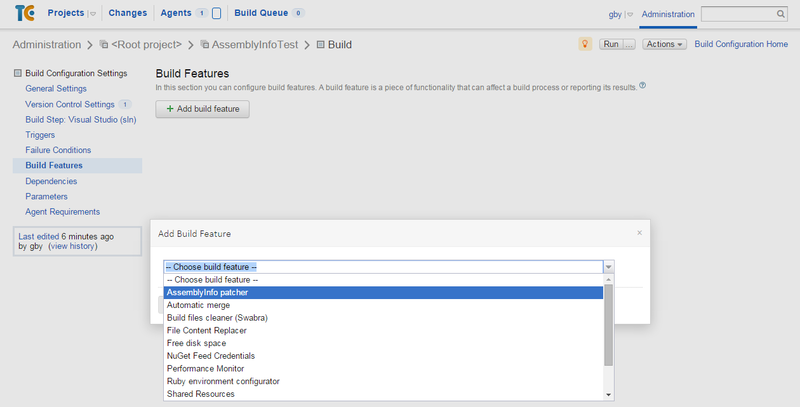 [Update assembly versions] Assembly info version was specified, but couldn't be patched in file C:\TeamCity\buildAgent\work\8c2a410f7087e36b\.NET\AssemblyInfoTest\AssemblyInfoTest\Properties\AssemblyInfo.cs. Is necessary attribute missing? Now it's time for a bit of Java! I will not discuss any electronics setup or Arduino code in this post. Take a look at the articles linked above to see information about PC-Arduino communication, controlling servos and building relay based circuit... I assume that you know what Spring Boot is, but advanced knowledge is not required to follow this post. Such message is easy to handle in error callbacks (thanks to 500 HTTP status code) and contains useful properties such as message and exception. Notice that arduino object of ArduinoConnection type is used inside executeTurretAction method. ArduinoConnecton is a Spring bean responsible for communicating with Arduino over serial port. Our controller gets reference to proper object thanks to Spring's IoC container. TurretController constructor is annotated with @Autowired so Spring knows that ArduinoConnection object needs to be injected. 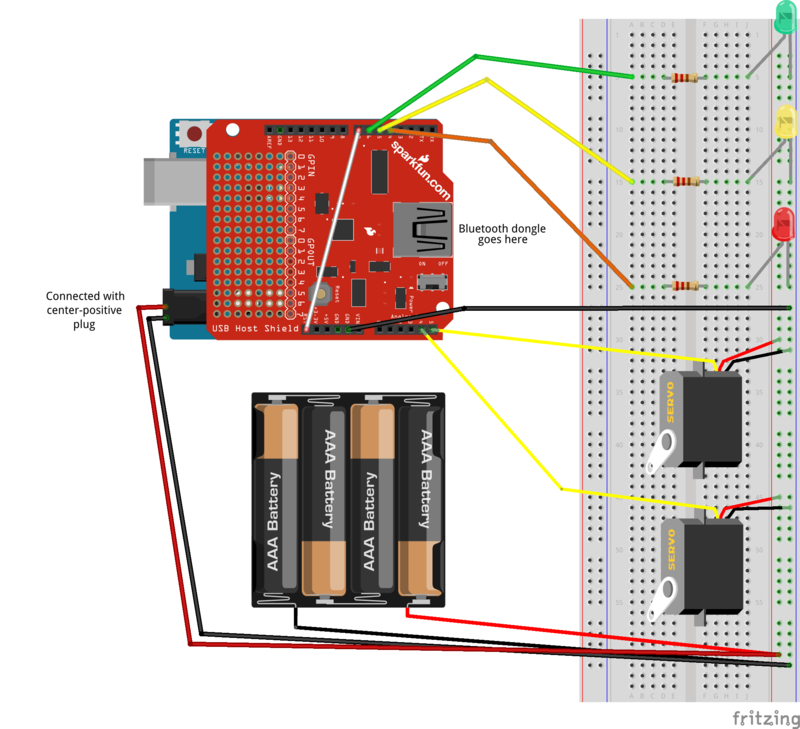 @Component annotation is there to show Spring that ArduinoConnection is a bean and as such Spring should take care of its lifecycle and usage as dependency. By default Spring creates beans in singleton scope. This is fine for us - we only need one such object. 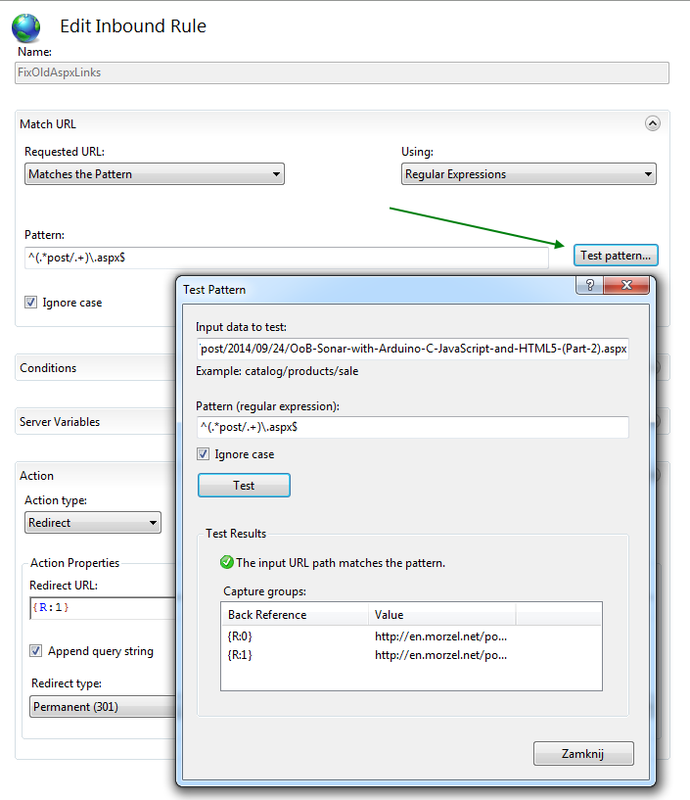 connect method is marked with @PostConstruct. This makes the method an initialization callback that gets invoked when ArduinoConnection object is created (it will happen when application is started). @PreDestroy is used on disconnect method to make sure that connection to serial port is released when the program is closed. Thanks to this Cross-Origin Resource Sharing filter it's easy to make ajax calls to executeTurretAction method without using some trickery like JSONP to circumvent same-origin policy restrictions. Time for the third episode of "Out of Boredom" series :) There was a Sonar project and something about shooting paintballs... 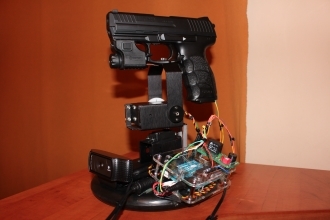 This time you will learn how to use Arduino and .NET 4.5 to receive input from joystick and use it to control servos that move a webcam horizontally and vertically! DirectInput class lets us obtain access to joystick. 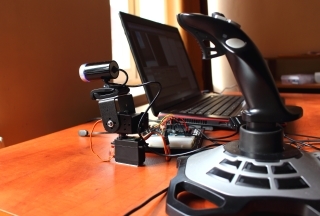 Its GetDevices method is used to look for an attached joystick with particular name. If such device is found, object of Joystick class gets created. Joystick class has Poll method that fills a buffer containing information about joysticks states. State info comes in a form of JoystickUpdate structure. Such structure can be used to determine what button was pushed or what is the current position in y-axis for example. Position is kept in Value property but before using it you have to check what that value means. This can be done by comparing Offset property to desired JoystickOffset enum value. See the docs of JoystickOffset to see what kind of values you can read. As you can see JoysticUpdate structure is used to determine current position in x-axis. 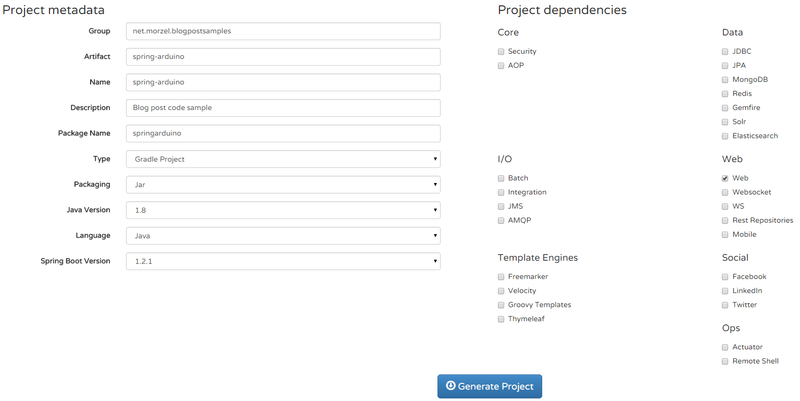 UI elements are updated and desired servo position is calculated... If you've looked carefully you might be wondering why if (rbPanOnXAxis.Checked) exists. This is done because the app lets its users decide whether pan (horizontal movement) servo should be bound to x-axis (right-left stick movement) or to zRotation-axis (controlled by twisting wrist on joystick - not all joysticks have this feature). In my case Arduino is accessible via COM3 port and baud rate of 9600 is sufficient. That's right - despite the fact that the device is connected to PC with USB cable it is accessible via COM port. 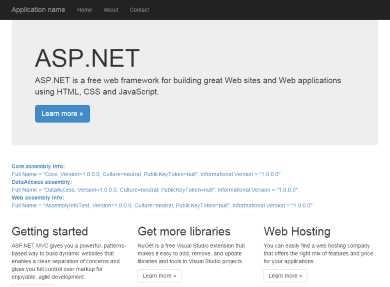 Communication with .NET application is implemented with Serial class. First, in setup function, a connection is established with Serial.begin(9600) call. Then inside a loop Serial.available method is used to check if packet with servo positions request has arrived from PC. If so, pan&tilt servo angles are read and servos are ordered to move. 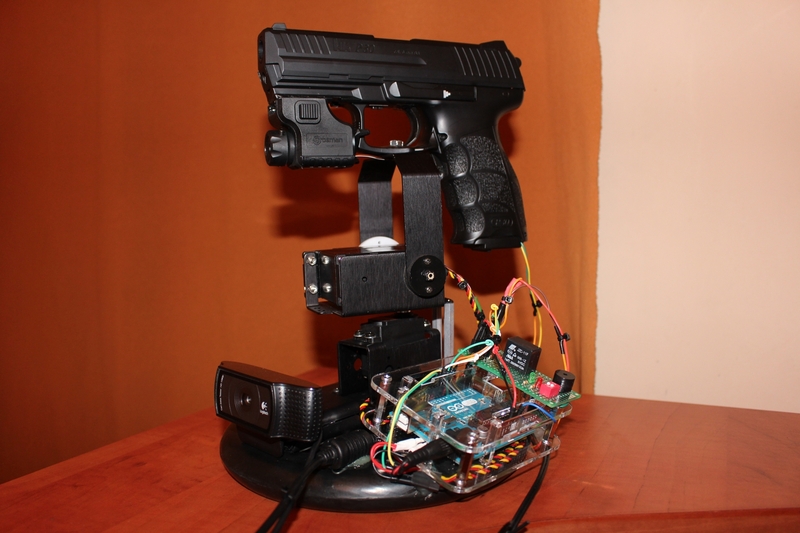 Update 2015-01-11: Click here to see a video of my recent project that has pan and tilt servos used to build gun turret!